Spoiler Alert: This post is very husband-bragging heavy. I gloat, I'm giddy and i can't tell you how wonderful my husband is with just words, but i try!!! It was a big deal for us now to set the precedent that we take the time to travel together to celebrate this date. So big of a deal that we opted out of buying Christmas gifts for one another so we could ensure we'd have the funds for our anniversary trip. Travel is important to us and sometimes the only way we can see our families, so while we do spend a lot of money on travel - it is a priority and we do our best to plan ahead to make sure certain events can happen. 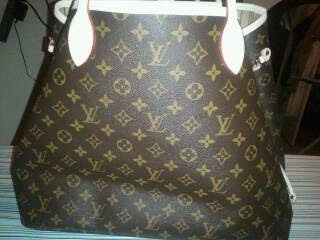 The enlarged image makes it blurry, but yes - that's a Huge Louis Vuitton shopping bag! ﻿﻿I had been telling my gorgeous and brilliant husband that i "needed" a new tote bag. Not just for work but for travel as well. I've been using this great huge beach bag lately just b/c i carry so much stuff - and having a nicer bag would be a bit more professional and of course, I'd look snazzier. I had looked around and initially thought I wanted a nice bag, maybe made of leather - but I quickly realized a tote bag is for "tote"ing things around. The lighter the bag, the less it adds to all the weight you are adding to the bag. So I realized, a canvas tote bag would be perfect for work. for travel. and for anything else that may come along in the future... the material is lighter than leather, more durable for wet weather or various elements, and versatile for travel and work. excuse the picture, i used my phone in my excitement. ﻿I'm so happy to have you around... the best birthday/anniversary gift that has arrived early from my beloved Husband. My love tank is over flowing and our trip to FL and LV with my new LV will be very fun!! We ♥ LV (both Las Vegas and Louis Vuitton)! But now the pressure is on... What to buy my amazingly genius, tasteful, brilliant and oh so lovable husband for our anniversary? Ideas anyone? Ohhh, what a perfect birthday gift!! That bag is perfect. Vegas is the BEST! We were there for a wedding three years ago and loved it. What an absolutely gor-geous gift! He did good you're gonna have to really think up of a fab gift for anniversary! Enjoy Vegas...I went for the first time for my bday 2009 and I am in love with that place!!! Man, what a gift! That bag will be hard to beat. Good luck! LOVE the new bag! Good job, husband. Congratulations on your new bag, you should take care of it.